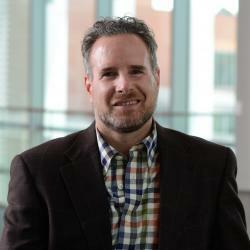 Jeff Pollack is an Associate Professor in the Poole College of Management at North Carolina State University. He received an undergraduate degree at Northwestern University and a Master’s degree in Organizational Communication at North Carolina State University. He completed his PhD in Management at Virginia Commonwealth University. Jeff maintains an active research program in entrepreneurship that focuses on the underlying psychological predictors of new venture creation, and the determinants of performance both at the firm and individual levels. Over the past 15 years, Jeff has accumulated a variety of entrepreneurial experiences from working in small family owned firms, to buying and selling businesses, to investing in businesses. These experiences shape his perspective on research in the domain of entrepreneurship. Jeff’s research has been published in journals including Psychological Bulletin, Academy of Management Journal, Journal of Business Venturing, Journal of Business Venturing Insights, Entrepreneurship Theory and Practice, Journal of Management Studies, Journal of Management, Journal of Small Business Management, Journal of Organizational Behavior, Family Business Review, Journal of Managerial Psychology, Basic and Applied Social Psychology, and Journal of Leadership Studies.